If this was Ryan Tannehill‘s last game as a Miami Dolphin, it did not end on a good note. Tannehill struggled with accuracy on his throws that traveled beyond 10 yards and when under pressure. Due $27 million next season with a dead cap of less than half that, it’s likely we’ll see Tannehill in a different jersey next season. It wasn’t particularly a good game for anyone on the offensive side of the ball. However, the offensive line led by Ja’Wuan James was solid in pass protection. Kenyan Drake showed his ability on a handful of touches as well. Interior defender Davon Godchaux was one of the bright spots on the Miami defense. Godchaux had the second-most tackles on the Dolphins defense, despite playing in the trenches. The former LSU player made plays not only in the running game but also as a pass rusher. Although he had a quiet afternoon overall, Miami safety Reshad Jones made the biggest play for the Dolphins on this afternoon. Jones did well to read rookie quarterback Josh Allen’s eyes as he stepped in front of Allen’s target and then beat the quarterback to the goal line to score the defensive touchdown. Josh Allen has quietly become one of the more fun players to watch in the league, as you never know what you’ll see from him. He once again struggled in the air, he was inaccurate on multiple easy throws, and he also threw a pick-six as he stared down his receiver, but he more than made up for it on the ground. Allen rushed for 97 yards on seven carries, including two touchdown runs. Second-year wide receiver Zay Jones had a career day as he tied career records of 93 receiving yards and two touchdown receptions. Jones showed off his quickness on his first touchdown reception beating a defender to the sideline and then reaching for the pylon to extend Buffalo’s lead. While the Bills missed out on the playoffs a season after squeaking in, they still have an excellent defense to build around. Cornerbacks Tre’Davious White and Levi Wallace had excellent games and while White struggled in 2018 after a top 5 season as a rookie, his ability moving forward should serve the Bills well. Jerry Hughes finished his career year on a high note, as he was dominant in the run game and added a sack and a handful of hurries. Hughes entered the game as the ninth-highest graded edge defender and the number two pass rusher, and he had a performance that will push Dee Ford for the top spot. Miami: Tannehill and company couldn’t get it going through the air and a couple of costly mistakes did the Dolphins in. 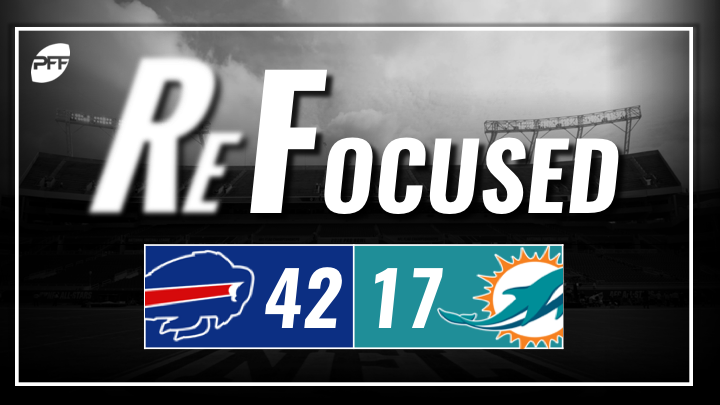 Buffalo: While Josh Allen struggled a bit with his accuracy, his scrambling ability was too much for the Dolphins to handle today.